Discrepancies between numerical and analytical solution for particle in a finite potential well? x = 0 :0.1:5;  % coordinates  interval. L = 1;         % well width. U_0 = 40;      % well depth. hbar = 1;      % Planck's constant. m = 1;         % particle mass. % Parameters for solving problem in the interval -L < x < L.
L = 5;                                               % Interval Length. N = 1000;                                            % No of points. % Finite square well of width 2w and depth given by U_0. % Discretized (three-point finite-difference) representation of the Laplacian. H = -1/2*(hbar^2 / m)*Lap + spdiags(U, 0, N, N);  % T = H + U. % Find (first 3) (smalest algebraic) eigenvalues. I'm expecting some error but in this case, the energies differ in an order of magnitude. Clearly, I am doing something wrong but I don't know whether the error is in the analytical or numerical solution. What am I doing wrong here? Any hint will be appreciated. 1. The vertical lines are discontinuity points. I think that your potential for the numerical case is wrong. The potential should be a big positive number, so the solution tends to zero outside the well when the value of the potential increases. Following is your code with corrections, notice that you also miss the step size of the finite difference. 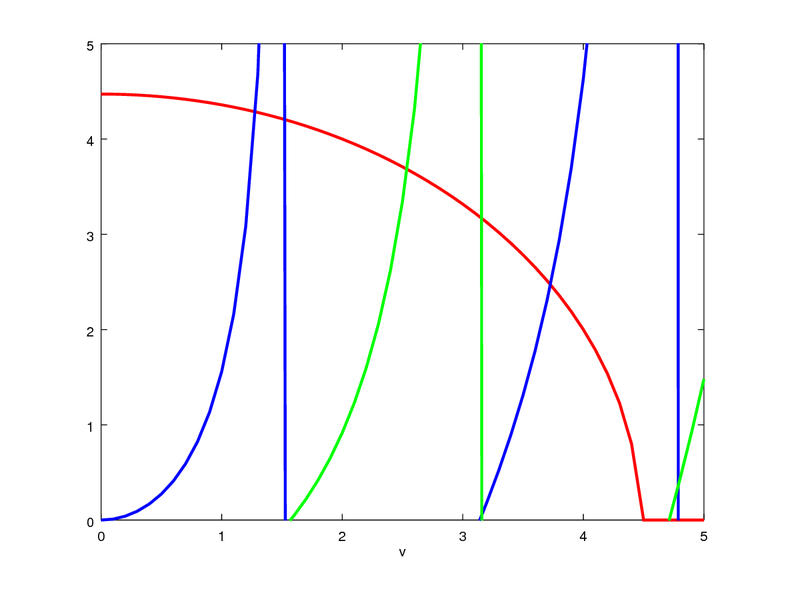 L = 5;  % Interval Length. N = 1000;  % No of points. Not the answer you're looking for? Browse other questions tagged eigensystem quantum-mechanics or ask your own question. How to numerically solve a laser driving semi-classical two-level system using Floquet formalism?